ENG: Recently, a democratic Swedish brand H&M finally presented the first results of the collaboration on a capsule collection with a young French designer Isabel Marant. Before making a wish list, let us determine whether the juice is worth the squeeze. RU: Намедни шведский демократичный бренд H&M наконец представил первые результаты совместной капсульной коллекции с молодым французским дизайнером Isabel Marant. Прежде, чем составлять wishlist, разбираемся, стоит ли игра свеч. In June this year, H&M announced about the new collaboration with a famous designer, eleventh by its count. The fashion-savvy skeptics unanimously gave it a summary: it will not be without wedge-heeled shoes. The overall picture was further expanded by rumors about the budget version of cowboy Milwaukee boots and ankle suede Dicker shoes – about them, for obvious reasons, there was little in a way of discussion. However, reality did not live up to expectation and instead of sneakers, which got labeled as “bad taste” lightning-quick, in Isabel Marant pour H&M a different kind of shoes were given extra attention – no platforms and a maximum low heel, an absolute boho-chic. Even then, there was some truth to the skeptic’s forecast: there was a place for suede in the capsule line and a place for Wild West in its fullest embodiment. Maybe, this would have found its consumer, were it not for Isabel’s words about her wanting to create “everyday cloths”. Exciting or disappointing? The opinions were divided: some dub the results of the capsule line as the best they’ve seen since a collaboration with Alber Elbaz and Lanvin, while the others can hardly distinguish between a designer collaboration and everything else they are used to seeing at H&M stores, when at some gorgeous weekday the salary arrives and you are sent running to the nearest retail store, where one is sure to find a shop by the Swedish brand. I personally don’t feel the excitement I used to, that a year ago I felt when I was studying the Maison Martin Margiela for H&M lookbook. And it is not about the sneakers or the absence of such. I respect any art and I am ready to be open-minded about it, but when it comes to the collaboration with Isabel Marant, there is definitely room to grow. A platform is not likely to help in this, but time definitely will. 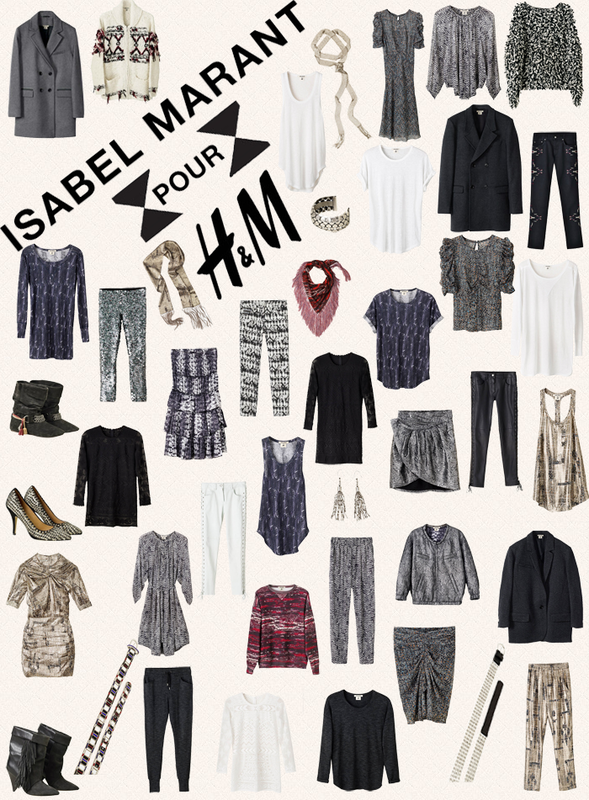 And what say you about the presented collection Isabel Marant pour H&M? Which wardrobe pieces from this capsule line has made it to your wish list? О новом, одиннадцатом по счету сотрудничестве с известными дизайнерами H&M объявил в июне этого года. Модные скептики единогласно тут же подвели итог: без кроссовок на танкетке точно не обойдется. Картину дополняли слухи о бюджетных версиях ковбойских сапожек Milwaukee и замшевых ботильонов Dicker - о них, по понятным причинам, судачили значительно меньше. Но заявленные ожидания не оправдались, и вместо сникерсов, рекордно быстро получивших ярлык "дурновкусие", в Isabel Marant pour H&M особое внимание уделили совсем другой обуви - никаких платформ и максимально низкий каблук, абсолютный boho-chic. Впрочем, в прогнозах скептиков была и доля правды: в капсульной версии нашлось место и для замши, и для дикого Запада в самом полном его представлении. Вполне возможно, такие мотивы пришлись бы многим по душе, если бы не слова Изабель о том, что она хочет создать вещи "на каждый день". Восторги или разочарования? Мнения вновь разделились: одни называют результаты капсульной коллекции лучшим, что они видели после сотрудничества с Альбером Эльбазом и Lanvin, другие едва ли отличают дизайнерскую коллаборацию от всего того, что привыкли видеть в магазинах H&M, когда в один прекрасный будний день получаешь зарплату и бежишь наряжаться в один из ближайших торговых центров, в котором обязательно есть магазин шведского бренда. Лично я не испытываю былого восторга, который год назад переживала при изучении лукбука Maison Martin Margiela for H&M. И дело вовсе не в кроссовках и даже не в их отсутствии. Я уважаю любое искусство и готова его принимать, но в случае с этим сотрудничеством Изабель Маран еще есть, куда расти. В этом вряд ли поможет платформа, но поспособствует время. А что скажете вы по поводу представленной коллекции Isabel Marant pour H&M? Какие предметы гардероба из этой капсульной линии попали в ваш wishlist? полностью разделяю твою точку зрения! I really love the collection! I'm always so behind on the collabs H&M do but there are a few items from this collection that are cute. Never lives up to expectations though does it? Однозначно коллаборация Maison Martin Margiel для H&M лучшая ! На самом деле мне очень понравились первые снимки промо-кампании, с трепетом ждала полноценного лукбука. Но сейчас смотрю на все вещи и на самом деле взгляд почти ни на чем не останавливается. Я вспоминаю времена коллекции Lanvin - там каждое платье знали "в лицо", да они кажется до сих пор популярны! А здесь нет таких key pieces благодаря которым бы эта коллекция запомнилась покупателям. I think the collection is awesome, you can feel the I.Marant spirit. But there are similar items around (and so cheaper) so we can get almost the same clothes for less money! I know I have heard about this! So exciting. I always pass an H&M on my way to work and I sooo need to stop in. Hmm.. it looks good, but I haven't been to H&M in forever and don't know if I would drive an hour and a half to go for this. I would need to see it in person for sure! I hope you have a good week dear! Of course there are nice pieces like the black coat or those black boots... but thats all. It´s really sad this time and the prices are to hight for this stuff! Whoo, such a great collection, dresses are all beautiful. Hmm I've some some things there I'd definitley like to bring home with me.. but it all depends on the price. Also, I am never willing to queue for silly hours, so the good pieces tend to never be available once the commotion has died down. Oh well. I think sometimes there is way too much hype over these capsule collections. I need to bring some of these stuff back! I had high hopes for this collection - I'm not a fan of Isabel Marant's wedge sneakers but I do love her designs. I think they could be much better represented than they are by this collection though, sadly. this collections looks like a dream!!!! want it all! So much on here that I love! Some of the stuff is amazing! จีคลับ Online gambling games are very popular. Do not go to the casino to waste time. All the fun. There are easier bets. There are good gamblers like this. Gambling sources that everyone likes. Make good money every time. Realistic with gambling every day. Like or interested in playing gambling online. It allows players to play in all areas with easy bets to play on their own. Gambling is a good bet to get good results all the time. Always good bets are played by everyone who is popular every day.